Ever have a recipe say “dot butter on top”? Then you try and do it and wind up with butter all over the place wasting more than you needed to! Here is a quick tip to save you time and your precious butter! This will also give you a nice and even spread of butter all over your dish. Grate it! 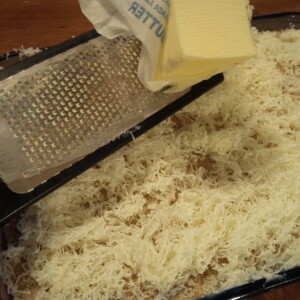 Just use any old handheld grater(mine was a pampered chef microplane). Make sure you use cold butter from the fridge. I hold the stick in the paper with it folded back. Keeps everything nice and neat. Move it all around just like you would cheese! This works well and gives you a nice even coating while it bakes. What are your favorite “quick tips”? We would love to hear them!